An explanation of how we learn about the brain. Thomas describes using playdough (stuff that can easily be made in a home kitchen) to make circuits and teach about electricity (using inexpensive and child safe components). As a continuation of "The Tao of Pooh," Hoof talks more about Taoism but this time focusing on how to implement the Taoist principles in life. A brief, and visual, discussion about internet trackers with some ideas on what to do about it. Pulling from the well known stories of Winnie-the-Pooh, Hoff gives a general overview of the principles of Taoism that is at once simple to understand, easy to use and profoundly impacting. Gleeson presents a brief thought on how companies can use normally jarring moments (such as a user coming upon a “page not found error”) to build relationships with their users. This is interesting to me because while the graphic is a nice illustration of a web (a watery, mountainous area food web in particular) it is not an ecosystem any more than a chore chart is an example of a family unit. As many an ecologist will explain, ecosystem has less to do with lines pointing to things with descriptions of how they combine, interact or survive together and more to do with the establishment of a community as a whole. It is very much the same way we view our human communities. Remove the houses, cars and roads and you still have a community of people (though they are likely to rather grouchy from having their houses, cars and roads taken away from them). Remove the people though, and you are left with a museum exhibit. While planning a presentation for a professional conference that my work was invited to present at, we hit this topic of ecosystem (I probably brought it up as I have been pushing to build an ecosystem instead of systems since my third day on the job). During this discussion I realized that most people’s idea of ecosystem (lines connecting different things) is far different from my idea of ecosystem (a, preferably tight knit, community that evolves together). To others our recently completed projects were seen as systems (disparate systems) and processes (distinct and differentiated) with new projects to come as new problems were identified. To me, however, our recently complete projects are seen as parts of an ecosystem (highly connected components) and sustainable processes (automated processing that is scalable and thus sustainable) with new projects being identified as the ecosystem matures. The answer is simple: competition. My work stays in business because we can make a more compelling offer to our clients than our competition. This may seem obvious to some, but others get confused about things like having a superior product, having a superior set of morals or about delivering superior customer service. In fact, “ quantitatively superior" is hardly ever a key factor in winning over customers. Think of the last time you bought something because it was quantitatively superior (that is, the primary deciding factor was that the measurable facts showed that the product you bought was better than the one you did not) and not because it is qualitatively superior (that is, the primary deciding factor was not the emotional, mushing gushy side of you liked it more). Chances are that it was either a purchase made a long time ago or one that was heavily influenced by someone else. We generally purchase things because we feel like they are superior rather than purchasing things that are factually superior. Cars are a fantastic example of this, most people would rather buy an SUV that is far less fuel efficient, costs more for insurance and maintenance because they feel safer driving them, they enjoy the thought of being able to haul more people and stuff than they almost ever do or they love the thought of being able to go off-roading even though we all know that their car is far too pretty for them to ever take it into the bush. The SUV feels superior though it is factually (for most people) far inferior than their needs. Coming back to competition, creating a collection of factually superior systems is something that could be easily produced by the competition. They could even fake the systems by hiring gobs of workers to handle things and make it seem like things are automated. An ecosystem, on the other hand, that has a unified look, feel and functionality and “just works” for the client is much harder to reproduce (especially when reacting to competition instead of leading it). In order to remain differentiated from our competition and to provide that superior feel, it is in our best interest to try to integrate and unify these systems as much as possible in order to lead the market in the long term and to stay far ahead of the competition. Thus I cry, "build an ecosystem and they will come." 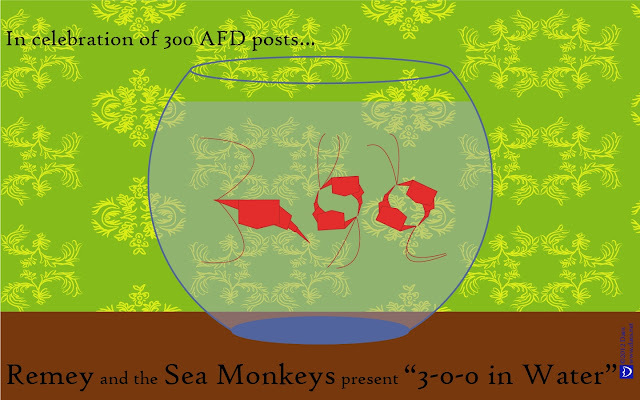 Yes, indeed, this is the 300th post. It seems like just yesterday that I hit 200. A fascinating blend of art, magic, technology and truth by Tempest. Tempest demonstrates the blending of a virtual world with the real world to help tell a story about magic. Another jaunt into the world of technology and magic by Tempest. Ringen discusses in frank terms why the reign of the British New Labor party from 1997-2007 failed to enact the goals that they set out to accomplish. In the end, Ringen concludes, the government failed in spite of competence. Morozov points out that there is a difference between the intended and actual use of technology. He suggests that we cannot blithely assume that if we simply open the technological floodgates to liberate repressed persons that they will use it the way it was intended. Morozov points out that many of the countries that we would liberate are actually actively using technology (even encouraging their peoples to use it too) but in other ways than we would intend them. For example, dictators appeal to the sense of national pride in asking citizens to report person denouncing their leaders through a crowd sourcing system. When critical mass is reached for a particular individual then the government acts to shut the out spoken down. In other words, the concept that technology naturally liberates people is false and sometimes even dangerous. RSA Animate - The Internet in Society: Empowering or Censoring Citizens? The old methods of knowledge classification are failing because it is based on a tree layout: the big trunk and large branches which have ever smaller branches with no interaction between the branches. The thinking that everything belongs on a given branch and does not connect to any other branch is failing us. Lima points out that we really need abandon the old tree model and adopt a new network or web based layout system where we can accurately map out interconnectivity. Yet again, I find myself missing writing. Though this time, unlike the last, it is not because of school or working a crazy intern schedule but rather because I find my job so incredibly fun and stimulating that I have little creativity left over for writing. For example, today we ran our first employee through the new online, self-validating, mostly automatic, employee application form (to process employment applications for our clients). It was fantastic to get a magic email with an attached PDF generated all by a magic a script that I have been crafting for a couple of months (well, that one script just took a couple of weeks, but the entire framework has taken the couple of months). My boss was so excited I could hardly believe it. I am excited to continue to expand the system to handle the entire hiring process. Contrary to popular psychology, our brains are not divided in the traditional “arts and crafts in the right side, math and science in the left side.” Instead, McGilchrist discusses research (research that we have known about for some time) that shows both sides can handle all topic but that the left hemisphere is about concrete, solid and literal thinking where the right hemisphere is about general, abstraction and experiential thinking.